The speed limit on a section of Melton Lake Drive will be temporarily reduced for at least three months starting Monday while the eighth rowing lane is built, and part of the Melton Lake Greenway will be closed as necessary, city officials said. The speed limit will be reduced from 45 miles per hour to 25 mph along Melton Lake Drive between Amanda Drive and Palisades Parkway, a City of Oak Ridge press release said. The change will remain in place for a minimum of three months beginning Monday, October 31. Signs will be installed to warn drivers of the reduced speed limit. The project will also require about 500 feet of greenway to be removed and replaced at the end of construction, the press release said. As a result, a section of Melton Lake Greenway between Amanda Drive and Palisades Parkway will be temporarily closed. Shannon Moore has been hired as the head coach for Oak Ridge’s Atomic Rowing programs, the Oak Ridge Rowing Association said Saturday. Moore will direct the developmental and competitive programs for junior novices, men’s and women’s varsity, and adult rowing programs, the ORRA said in a press release. Moore was a decorated rower for Ohio State University, was a member of the US Rowing National Team, and medaled in both the women’s 4+ and women’s 8+ races in the USRowing National Championships during her amateur rowing career, the press release said. The Oak Ridge Rowing Association boathouse at Melton Lake Park on the Clinch River. 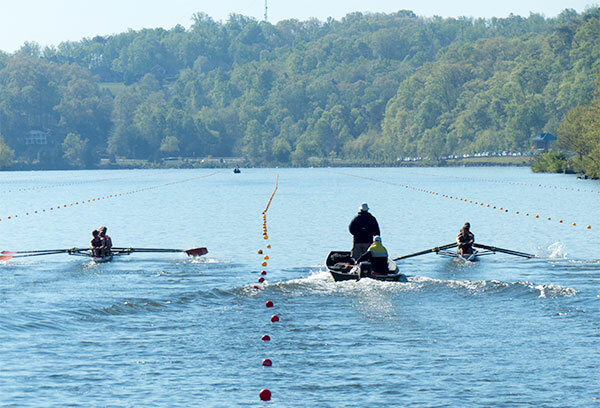 The Oak Ridge Rowing Association will host a special Learn to Row class for the visually impaired and blind on Sunday, September 14. ORRA is partnering with Visually Impaired/Blind Enhanced Services, or Club VIBES, to offer the class, which starts at 2 p.m. Sunday. Club VIBES is a nonprofit organization with a mission to assist blind and visually impaired young people in the Knoxville area to live independent and productive lives by identifying their unique capacities and developing their individual strengths, a press release said. Club VIBES provides a free mentoring service for visually impaired or blind youth and their parents/guardians residing in or around the Knoxville area. The head coach hired in August has resigned from the Oak Ridge Rowing Association. Coach Marc DeRose, who was also rowing director, has concluded that this was “not the right fit for me and my family,” a Friday afternoon press release said. The release said a team of veteran ORRA leaders has moved into new roles within the organization. The new team management approach started after the resignation of DeRose, who replaced longtime head coach Allen Eubanks late last summer. On Monday, Dynamic Dragon Boats came to Oak Ridge to prepare locals for the city’s Inaugural Dragon Boat Race scheduled for May 31. Monday’s event served as a beginner’s guide to the city’s first event, but also hosted young adults in Emerald Youth Foundation’s JustLead group. Penny Behling and her husband, Chris, own the Dragon Boat company, a Knoxville firm that participates in dragon boat events around the country. The pair said the sport is really gaining interest in the Knoxville area, with inaugural events in Oak Ridge and Blount County scheduled this spring and summer, as well as Knoxville’s Dragon Boat race June 21. Dragon boats are long canoe-like boats adorned with the faces of Chinese dragons. They hold teams of 20 with participants arranged by size. Behling said dragon boat festivals are gaining steam in the area simply because dragon boating is easy to do. This year, she has five scheduled events in Tennessee, and more nationwide. Marc DeRose has been hired as the new head coach and director of rowing at the Oak Ridge Rowing Association. After 13 years here, the head coach of the Oak Ridge Rowing Association is leaving the Secret City. Allen Eubanks no longer works for the ORRA. The rowing association’s board agreed unanimously earlier this month that Eubanks was “no longer needed for the position he held,” ORRA President Bob Franks said Monday. Franks declined to elaborate on the personnel change, which he called a business decision.